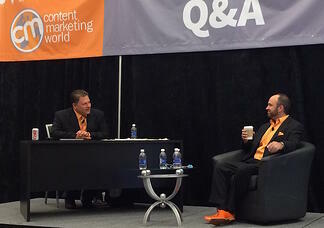 I remember a session at Content Marketing World 2014 where Buddy Scalera (@MarketingBuddy) was interviewing Joe Pulizzi (@JoePulizzi). Pulizzi was telling us how he made the decision to leave his job and start his own company. He explained his thought process, what challenges he faced, what was important to him and how that led to the creation of Content Marketing Institute. It was one of the best sessions of the conference, until one attendee mentioned that she wasn’t learning what she anticipated based on the title of the session, How to Create a Dominant Media Brand. So, Pulizzi switched to listing out the specific steps to build your brand. 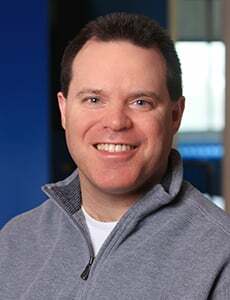 Luckily for those that enjoyed his personal story (and understood how it related to building his brand), he’s continued to share it in blog posts, podcasts, and now in his brand new book, Content Inc, appropriately released in time for Content Marketing World 2015. With Content Inc., Pulizzi lays out the steps to create a successful business by using content to build your audience, before you even have a product. While the book offers many examples of entrepreneurs that have used this approach, the process is easily transferable to corporations that are looking to build and implement a content strategy. Before going over the Content Inc. approach, Pulizzi reminds us that we must first document our goals and review them regularly. This practice has been preached consistently for well over a year now, as the annual research done by CMI and MarketingProfs (@marketingprofs) consistently shows that the most successful content marketers perform these two actions. Documenting your goals makes them real. 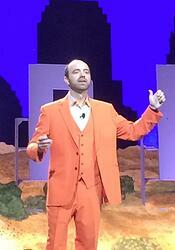 Pulizzi quoted Doug Kessler (@dougkessler) at CMWorld 2015, “If you don’t write it down, it doesn’t exist.” Reviewing them regularly keeps you focused on achieving what you set out to do. Build your audience by focusing on their pain points. Use this information to form the solution that only you can offer. You’ll be able to create the product they need if you understand your customers better than anyone else. Start by building one audience. Become the trusted expert to solve their problems. Once you’re successful with this group, then expand to another audience and repeat. The Sweet Spot: This is the subject matter in which you have an abundance of knowledge or skill, as well as passion. The knowledge gives us expertise, while the passion drives us to be successful. The Content Tilt: The content tilt is how you differentiate your content from your competitors. I love the example of Claus Pilgaard. He discusses the taste of chili pepper varieties while everyone else is talking about the heat. Building the Base: Choose one platform and become the industry leader on that channel before expanding to other channels. It may take years, but the best media brands all started with one channel that they dominated. Your best bet is to choose a channel that you own. Harvesting Audience: Your goal is always to grow an audience. Ideally, you want to build your email audience because that becomes an asset that you own. Social media audiences are good, but the platforms technically own those lists and can restrict your access at any time. Diversification: This is when your audience is growing and you’re ready to expand into new channels. Pulizzi describes the “three and three model” that he finds most successful. The first “three” are for building a personal brand: a blog, a book and speaking. The second “three” are for business: digital, print and in-person events. Monetization: This might just be the holy grail of the process. Now that you’ve established your expertise and built your audience, you can charge for your product or service. 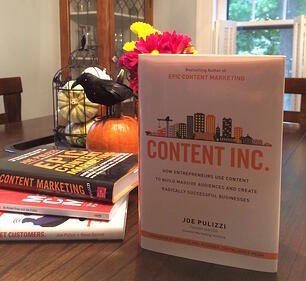 Pulizzi offers multiple examples of ways to monetize your content. If you’ve been reading Pulizzi’s blogs or listening to his This Old Marketing or Content Inc. podcasts, then you already know that this is not fast approach. On average, it takes 15-17 months to monetize a content marketing program. You need to have patience and stick to your strategy, especially when it’s taking longer than you want to prove your success. For those of you that are applying this strategy in a corporation, you’ll have to fight even harder when your CEO grows impatient and wants to change up the program to spur results … or end it all together. This is one reason that you review your documented strategy regularly. It will help keep you focused, and remind you to stay the course toward your end goal. Who Should Read Content Inc.? Just like Epic Content Marketing, Content Inc. is a must-read for anyone looking to implement a content marketing strategy and/or needs to build an audience. Pulizzi presents the six steps in a way that is manageable, while offering examples and exercises to get you started. I don’t want to call it “easy” because that would be misleading, but this is about as straightforward as you can get for building a business or a new business approach. With Content Inc., Pulizzi has both explained how and why he created CMI, and laid out the steps in which to build a successful business as neatly as can be done. Looking for other resources to improve your performance today? Download the Marketing Performance Pack, our free toolkit that's designed to help you improve your marketing.